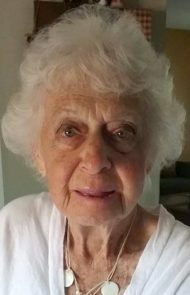 Lois E. McKillips, 88, of White Horse, PA passed away Saturday, February 2, 2019. Born in Lancaster, she was the daughter of the late Benjamin H. and Mary A. (Leaman) Stahl. She was the loving wife of the late Robert K. McKillips with whom they celebrated 67 years of marriage together before his passing in 2016. She was a member of the Order of the Eastern Star. Lois worked in the restaurant business as a waitress for several years. She loved going to the family cabin in Slate Run, being with friends but most of all she loved being with her family. She was a longtime member of St. John’s Episcopal Church in Compass. Lois is survived by her 3 children: Vicki L. Sylvester of White Horse, Bob McKillips, husband of Cindy of Leola, Tami L. wife of Michael Trout of Sinking Spring, PA; 9 grandchildren and 8 great-grandchildren. She was preceded in death by a grandson and one brother. Graveside Services will be private and at the convenience of the family. In lieu of flowers, contributions in Lois’s memory may be made to Hospice & Community Care, PO Box 4125, Lancaster, PA 17604-4125. Your mother will be missed at St. John’s Episcopal Church. She was a very gracious lady and always had a smile & a twinkle in her eyes for you! Please accept our deepest smypathy. Linda & Ron Zynn, New Holland.